I have been looking forward to trying this camera out ever since it was announced. I own a JVC HD201e, I don’t use it anymore and I really should sell it but I loved the picture out of it. I shot a lot of my 35mm stuff with it, including most of the Anorexia Series, pretty much all my work with the Brevis was done with it. At Broadcast Live I had a quick play with it and it looked great, so I was eager to get it for a couple of days to try it out and review it. 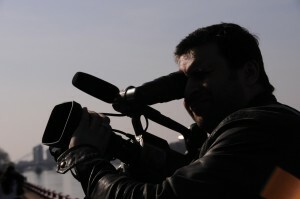 CVP.COM hired me to make a video review of the camera, like I did for the Panasonic HPX 301e. I spent the afternoon shooting with it in Battersea Park in London. Mark Dawson of Londonmark Films came along with his F350 to get some shots of me using it, kind of behind the scenes type stuff, and get a few remarks to camera that I was going to make whilst using it. The next day Dennis Lennie filmed me with the Letus Elite and an EX1 for the top and tail review parts of the video. New camera block, still 720p but “spacial offsetting” brings it up to 1920×1080 which it can record in for first time. Records to EX codec 19,25 or 35mbps wrapped in a .mov for instant use with Final Cut Pro. I really struggled with getting the HDV 720 JVC footage into FCP in the past…those days are gone! 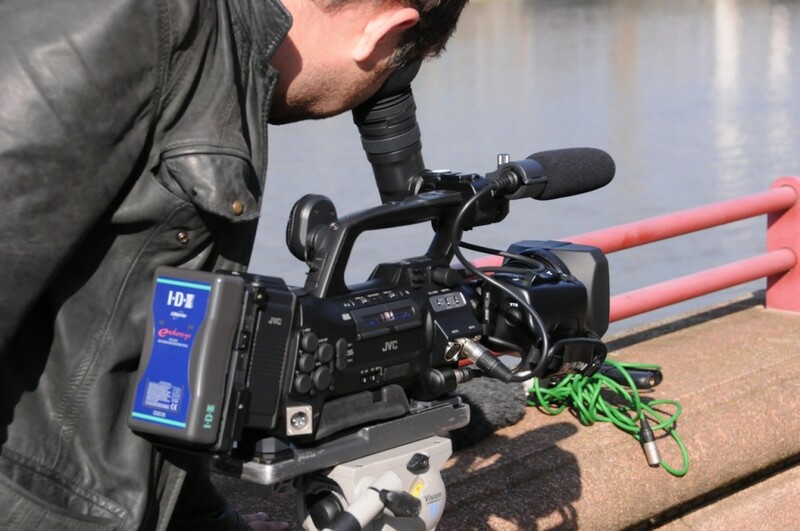 Recording on affordable Class 6 or higher SDHC cards, check out the net for good deals, avoid high street chains! Button layout is much improved. 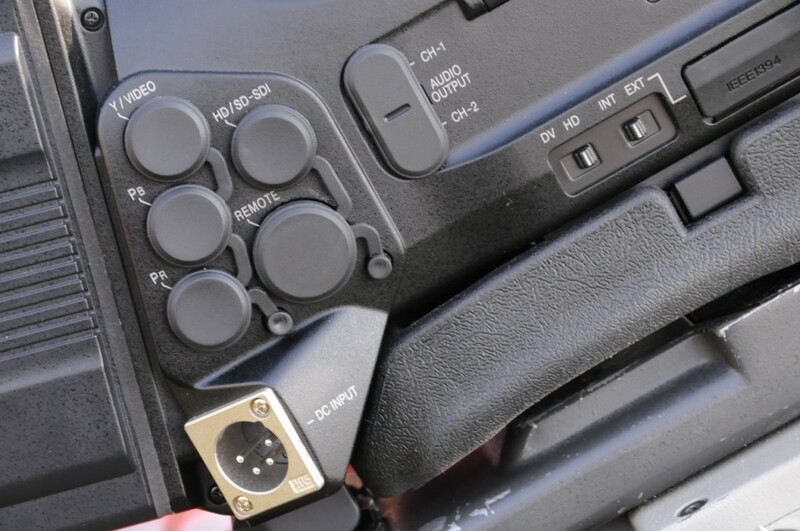 Really like the shutter control buttons. Composite, component and Hd SDI out. All using proper BNC connectors. Camera is 50/60hz switchable for world use. Can stream DV or HD out of the mini firewire port. LCD enormous and higher rez but tricky to see in bright daylight. Stock fujinon lens is “OK”, if you buy lens with this camera get the slightly more expensive Canon one, it is far superior. CCD still, not CMOS so no skewing and no camera flash issues but only marginally better than the JVC201 in low light, not a patch on the EX1/3 and Panasonic HPX 301e. This is to be expected as the chip is still 1/3 inch and CMOS is way better than CCDs in low light. I got quite a lot purple fringing with the Fujinon lens but I completely expected it. It’s the same lens as on my old JVC that is why I cannot recommend enough getting the better Canon lens. It is usable but you would be doing the camera a diservice. Disappointingly there is no timelapse/ interval recording. Don’t know why. It doesn’t make much sense. I would really miss it if I owned this camera. It’s such a great tool and it’s available on all the other tapeless pro cameras out there. Maybe JVC could implement it with a firmware update? If you want to learn more about the tech specs, do visit Tim Dashwood’s review on DVINFO.NET. He used a pre-production model. The camera I used was a production model. I really liked the images I got out of the camera. I shot in 1080 HQ 25p most of the time and although not as detailed as a true full HD chip it looked good, I always thought JVC produced really nice filmic images out of their cameras and this is no exception. 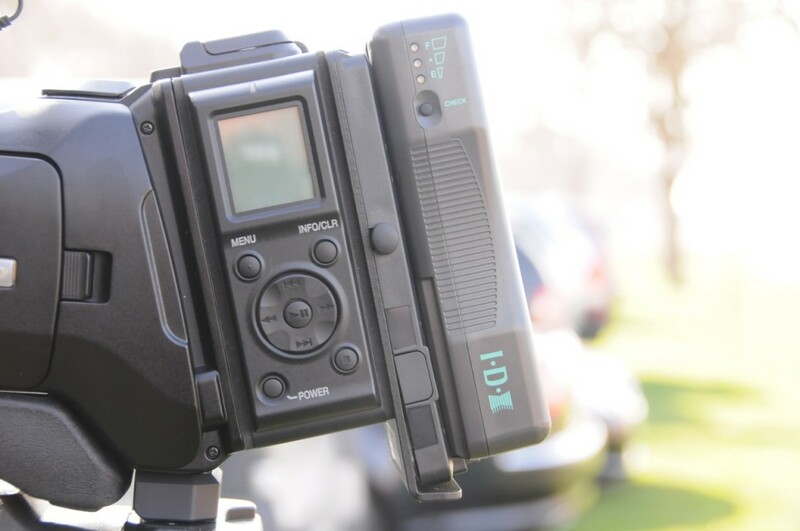 It would work nicely with a 35mm adaptor, especially one without a flip like the Cinemek G35 as it has an electronic image flip in camera for viewing and recording. Like the 200 series has. Take a look at my video review here to also see some images that I got out of the camera. This review & film was excellent and your photography was beautiful, pat yourself on the back. There is clearly a problem with chromatic aberration on the stock Fujinon lens, so I’d be keen to see if the Canon lens (which is supposed to ship with this camera according to the JVC website) does any better. The JVC site specifically discusses CA issues and says that the Canon lens is designed to resolve this, so why they let you loose with the Fujinon I don’t know. Apart from this the images have a great film look and the advantages of CCD on skewing issue cannot be under estimated. On my last doco on the Nile, we shot on a Sony Z7 which has CMOS chips and every single long lens pan hit the cutting room floor – unusable. Low light performance will be an issue of course, but the advantage is that you get to wrap earlier and get a cold one in. The fact that the machine is laid out and balanced up like a proper “big” camera makes a lot of difference as well to hand held work. If you get the chance to re-shoot again using the Canon please let us know, but apart from that I’m pretty convinced that this is a good little machine and has to be worth the £4500+ VAT in the UK. With budgets dropping all over town, I am sure that a lot of shooters are going to snap up this machine for propoer ENG & low budge doco work. I am certainly very keen. Good job mate well done. Phil, can you please just clarify, you said this has image flip for viewing and recording, does this mean the image file is recorded inverted so you don’t have to flip in post, in other words you can record correctly with out a flip adaptor..
PS.. Do you think you will ever get down under any time soon, there are plenty of former convicts who would love to catch up with you for a beer…..Hic..
Todd – in case you are on tenterhooks waiting for the answer..,. Yes the image flip is for inverting the image when used with a lens adapter. In fact one very nice feature of the JVC proHD cams is the availability of the COPA adapter made specifically for the 1/3″ system (which needs this feature). It has a 16mm PL lens mount, opening up to a large family of high quality primes, and giving the 16mm DOF without the tuning, ground glass and bulkiness of 3rd party 35mm adapters. True but for space saving on media as well timelapse is v useful. Brilliant review, thanks. I have been looking forward to you getting your hands on one. I will be demoing the 700 in a week or so. I’m a little confused. According to the JVC website the 700 comes with a cannon 14:1 lens not the fuji. The footage you shot was with the cannon, right? Don’t know what deals are in each county. I assume they will vary dealer by dealer. Here is the UK you can get it body only, with a newly designed Fujinon 17x or the superior 14x Canon. I shot this footage with the old 16x Fujinon made for the old 100/200 line. Not a great lens, very prone to CA. 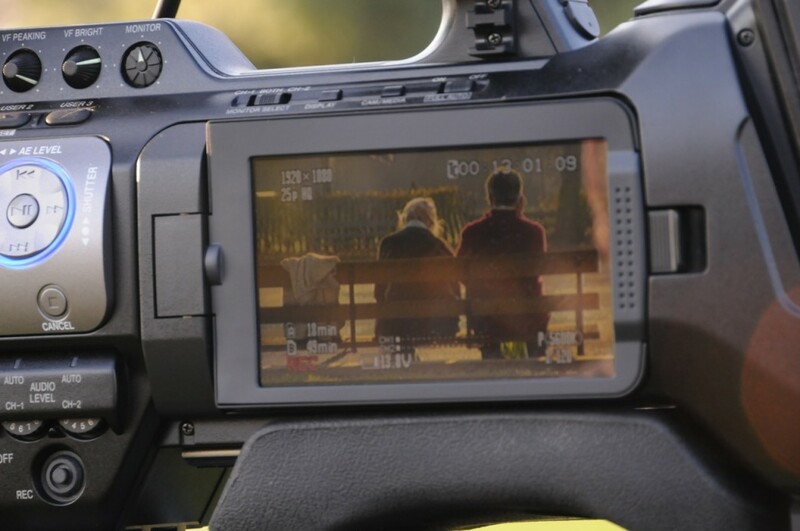 The Sony has a great viewfinder (for a photographer with aging eyes). Disappointed in the Sony being 4:2:0 otherwise I would have gone ahead with purchase. I know you reviewed the Sony EX3 as well. Not sure if anyone else asked you this question or not… Having tested both, which do you prefer – the Sony or the JVC? It use the same codec. So JVC=420. I think the color of JVC look better more organic but the image from ex are cleaner. Low light get grainy though. Thanks for the review on the JVC! Howcome your suggesting the Cinemek G35 over the Letus for the JVC? 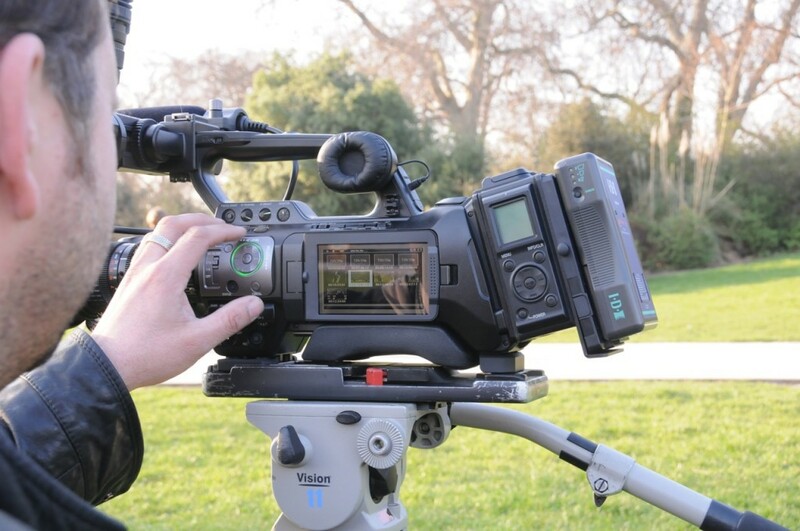 Just saying the cinemek would work well with the JVC as it doesn’t need a flip, it has built in electronic flip. Letus will work very well with jVC but ideally with a 1/3″ relay otherwise it becomes a rocket launcher! I am the lucky owner of a rocket launcher….The Letus mounted on a JVC 200 with the fujinon 13x lens. It is HUUUGE. I guess that here the G35 would be a great help. 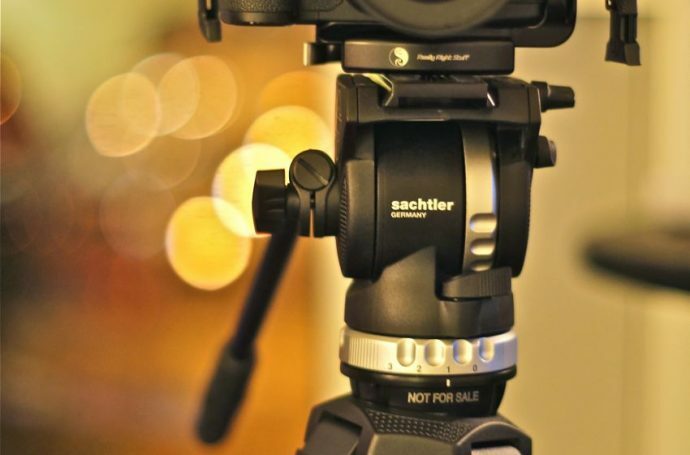 Also on a different note Phil the forums are raving about the new Redrock M2 Encore adaptor, a vast improvement over the old unit, I have never used one but I do like the mounting system on the rails compared to Letus..
What about that P+S Technik mini 35? I looked your video rewiev..
Having tested both, which do you prefer – the Sony or the JVC? now is time for bay new hd pro…. Thanks for a very informal review. 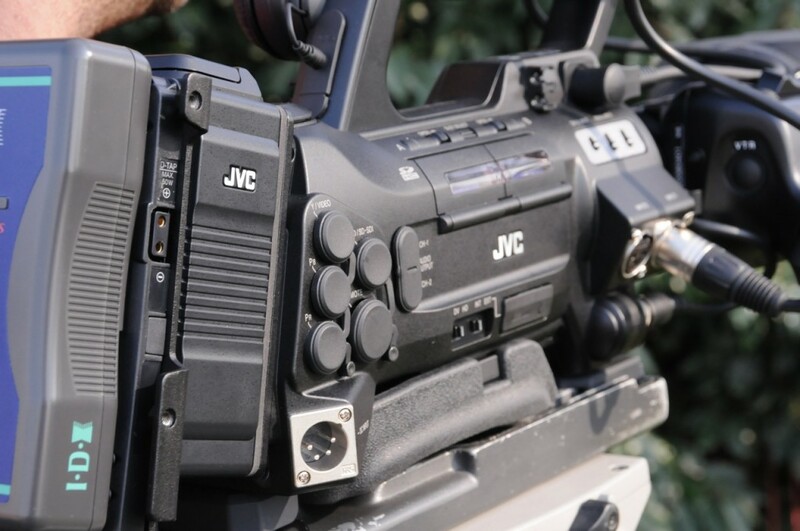 Have you considered testing the JVC GY-HM 700 D with the HZ-CA13U Cine Optical PL mount Lens Adapter? Do we know for sure yet which lens we get with this camera? The 16x or 17x??? I really like the look to this model and your pictures even with the 16x looked superb. I have looked at Tim Dashwood’s test charts and to be honest the difference is less than I was expecting. Hi Philip – Any comment on that earpiece that juts out from the handle? I was surprised you didn’t mention it at all as I’ve never seen something like that before. Helpful? I’ve got to imagine you’d have some unwanted noise floating freely if your ear wasn’t pressed to the muff! Are the files only compatable with FCP? I have FCE 4. I am looking to upgrade to a higher end cam but I’ve read only that it works with FCP. I don’t want to upgrade. the problem with the 700 and adaptors is until a 1/3″ relay comes out for it you have to screw your adaptor onto the front of the stock lens making it a bazooka. it works, just not practical. Can you connect 35mm lenses to this as with previous JVC models e.g. Sigma 100-300 f4 Nikon fit – has manual aperture ring? I am interested in this machine JVC GYHM-700. Can you upload some short GYHM-700 native footage to the net space (ex: mediafire,rapidshare…) and give me the file link to download? I would like to see the actual native footage and import to FCP for editing testing. My english is not good, I hope you can see what I mean. i am sorry I really don’t have time to do that right now. Check out dvinfo.net I am sure there are some native clips there. The machine is so so so good coz it produces good movies.I love it especialy here in uganda where new technology is only found with me LOL. Any ideas as to what this may be..and a solution. ayone has done Chroma keying test for JVC 700? specially on 24P HQ..
Hi Phil, could you please explain further why the Canon 14x is more superior compared to the 16x Fujinon? Thanks! simply a better quality lens. 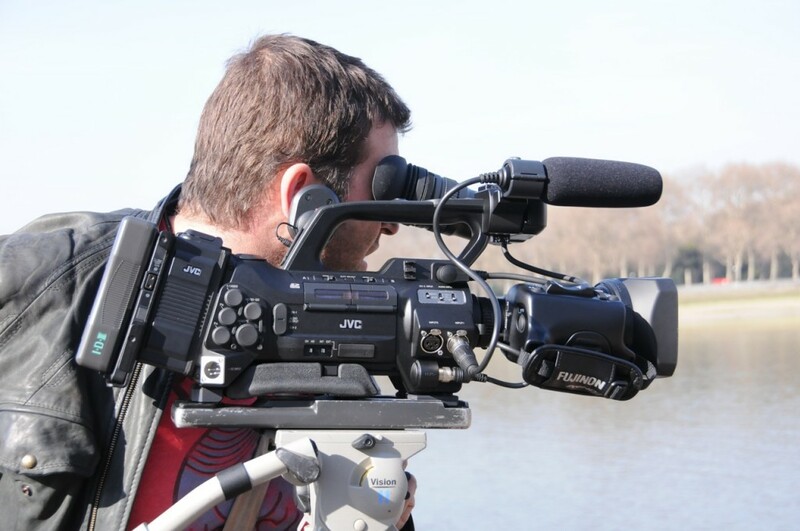 Great video… learned a lot… on the JVC 700 I wanted to know what setting you used to shoot the footages. I use the JVC 700 right now, but for news (so 60p on 1080×720). I have been trying to figure out the best setting to be on to get that film look, but haven’t been able to find the right setting combinations to make it work, whether if it’s frame rate, shutter speed, etc. I messed with the variable frame rate, but still couldn’t get the look that you had with your footages. Also, it seems as though I can’t get sound when I use the variable frame rate setting. Is there a remedy for that or you have surrender the audio when shooting in variable frame rate? thank you. Also, if you’re trying to get that film look, you could easily buy a 35mm adapter for the JVC. Much like this one. It will give you incredible depth. Hi I want to know what I have to do to shoot live via ustream and livestream with the jvc 700 what connections and menu settings I need to do? I Love your footage on the demo, a couple of questions. 1/ would you think this camera is up to shooting a TV ad? 2/ Which Lens, filters etc did you use on the demo? PS I have one already I just want to get the most out of it. Looking to purchase a new camera for corporate work – I am thinking about the HM700 with canon lens and a litepanels micropro led onboard camera light. What would you recommendation be – would the HM700 still be a good choice. I will be doing PR work and press conferences so need a CCD lens due to these blasted photographers and their flash guns !